The Spohrs Are Multiplying McLovin? Mike and I live near two universities. Most of the time I don’t think about our proximity to the schools, except for one thing – the students. There are a large amount of students that live in our neighborhood. Most of the buildings in our area are condos and apartments, and from October to June I feel like I’m back in college. The 2am drunk parties on the balconies, the screams when certain football teams fail to score, and my personal favorite, girls doing the walk of shame. I really like living by the schools because there are lots of fun bars and restaurants that cater to them. Mike and I have spent many an afternoon and evening eating bar food and enjoying happy hour specials. Many an afternoon, that is, until Maddie came along. We can take her to the restaurants, but a lot of the bars in California are 21 and over (California has a bunch of different kinds of liquor licenses). Of course, all the bars around us are 21+, which means our days of Happy Hour pitchers are over. And you know, we are totally okay with that. But sometimes, I really want 25 cent Jalapeno poppers and greasy bar food. Or like last night, when we were invited to an awesome event hosted by Primo Water. The hang up? It was at a bar. Luckily, my mom saved the day and came down to spend some time with Maddie while Mike and I had fun. But seriously, this “under age” thing is totally cramping our style. So I had this whipped up for Maddie. As a former bartender, I think it is flawless. I can’t wait to use it tonight! FOOT. IN. MOUTH.FOOT. IN. MOUTH. 1) According to her license… she’s only 20. She won’t turn 21 for another month and a half. 2) The critical mistake… never choose a birth year that will make her exactly 21 (almost). You should have made her 37 or 42 or something like that. Draws less suspicion. Otherwise… what could possibly go wrong, right? I think it’s high time that Maddie gets a taste of deep-fried pickles. Now, go register her to vote!! Ems last blog post..Life soundtrack compliments of Queen. I love Mclovin. I really should have stopped seth rogen on the street that time. I’m such a loser. mayas last blog post..Concerts, Talk Shows, Contests- Oh My! As long as none of the bouncers say they want to check her “profile”, I think you’re good. Life just got sweeter! Now when i’m the nanny, we can hit the happy hour together…me and Maddie, not you and me…although that would probably be fun too, but I’ll bet she’s a hot-guy-magnet! Whooo hoooo let the good times roll. Looks just like my own driver’s license. FINALLY! OMG! I’ve been like totally blocked off your blog for over a week. I’d see the header and couldn’t click over. I’ve missed you guys! Maddie is adorable but I’d keep her out of the bars just because of the smoke. I love it, and especially where it says she weighs 14 POUNDS!!! Yeah for weight gain! Anna Maries last blog post.. I agree with Joe that you have to try to fly under the radar. We learned this in making bad fake IDs freshman year in college. This one, however, is all-time classic. Brilliant concept, flawlessly executed. Bravo, madame! I’ve gotta bookmark it to show my wife. Heck, I’ll Stumble it, to share it with the rest of the world. I never even had a fake that good. Photoshop some wrinkles and you’ll be set! Very convincing. Bring on the beer! 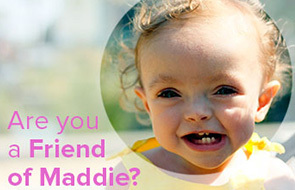 Maddie will DD, right? Oh my goodness. I think she will pass. Yes, she will. The days of no jalapeno poppers are ovah! That’s so much better than the fake ID I used after High School. Of course, mine was one of the old CA driver’s licenses, with a picture of someone who only sort of looked like me and was 30 years old, while I had the baby face of a 14 year old until I was in my 20’s. So I had mixed success with it. Maddie, however, should be able to get in just about anywhere. Hah! Just make sure she keeps a twenty in her booties in case she needs to pay the bouncer off. So? What bar did you go to? This takes “Wow! You look so young in your picture!” to a whole new level! DL pics are almost never that flattering. That was seriously adorable…and then Joe’s comment cracked me up. I can’t wait for Maddie to be 16 so I can take her out drinking. Oh wait. Did I say 16? I TOTALLY meant 21.